By February, a portion of the bio-degradable waste generated at Avadi, Thiruverkadu and Poonamallee municipalities may not reach the dump yards. As part of an effort towards decentralised solid waste management, the Commissionerate of Municipal Administration (CMA) is opening micro-compost processing centres in these local bodies. Transportation and finding space for dumping the garbage are major challenges faced by these local bodies now. To find a solution, the CMA plans to set up 33 decentralised compost processing plants. Each centre would have the capacity to convert 4 tonnes of bio-degradable waste into manure and would be operational by February. The CMA had recently signed a memorandum of understanding (MoU) with Bharat Petroleum Corporation Limited, which would fund the ₹10.96 crore project under its corporate social responsibility initiative. CMA officials said while 17 centres would come up, the remaining plants would be operated in Poonamallee and Thiruverkadu following the success of the initiative in Tiruchi and Vellore. While welcoming the project, residents of Avadi said the local body must put an end to the erratic collection and transportation of garbage. Besides launching a helpline to register complaints, the municipalities must ensure that these are not short-lived projects, they said. At Avadi, the sanitary workers were allowed to collect non-biodegradable waste on Wednesdays and sell the recyclable waste. Nearly 25 tonnes of the 140 tonnes of garbage generated was prevented from going to the dump yard, officials said. “These compost processing plants will be located about two km from the collection points in 28 wards and reduce the garbage by one-third of its actual volume. We plan to use the effective microbes (EM) solution to convert waste into manure. As of now, there are plans to use the manure in municipality parks and also provide it to residents free of cost,” said an official. 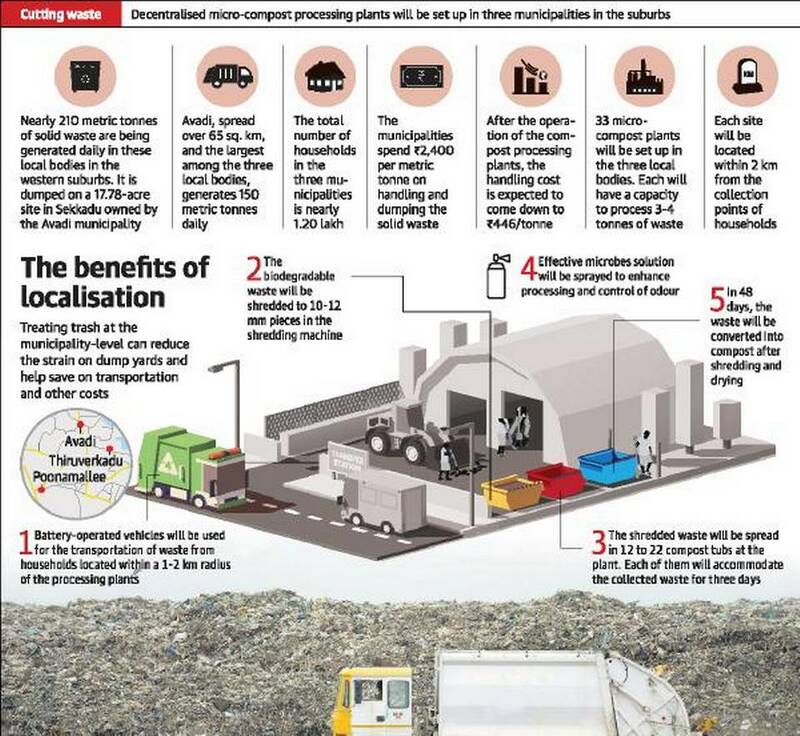 Besides aiming at reducing the volume transported to the dump yard, the initiative also aims at lowering transportation cost and reclaiming a 15-acre space in Sekkadu now serving as a dump yard and putting it to better use. At present, the collected waste is being dumped at transit points from where it is removed to dump yard. “We plan to use battery-operated vehicles to transport collected waste to the facility. In the long run, user charges may be levied,” said an official of the Avadi municipality. Volgend jaar tóch EM bessenpluk festijn!